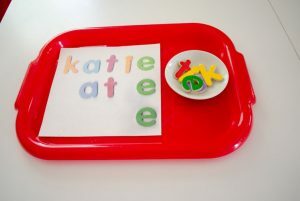 Name recognition is a staple to my preschool curriculum! If the children learn only one thing from me (but let’s hope it’s waaaay more), it is how to identify their names. 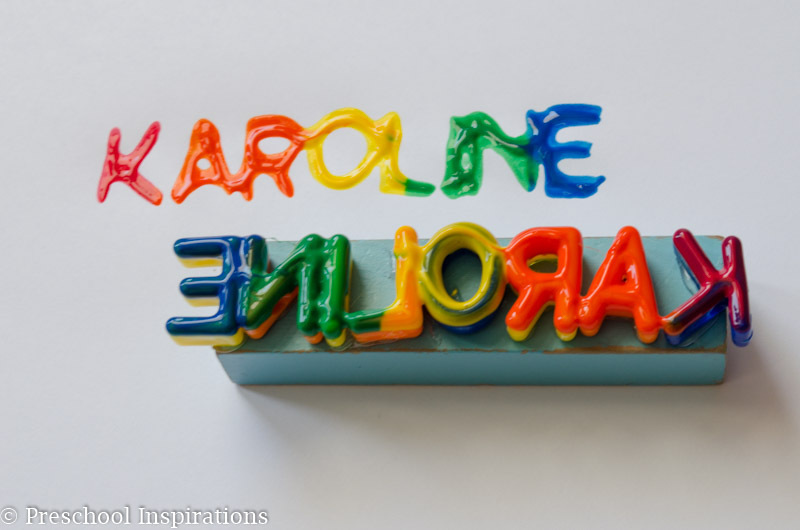 For today’s back to school themed blog hop, I decided to try out this DIY Name Stamp. Sometimes the first week of school is intimidating, and the only thing a child wants is familiarity and acceptance. Hopefully this will provide just that in a simple and fun way. 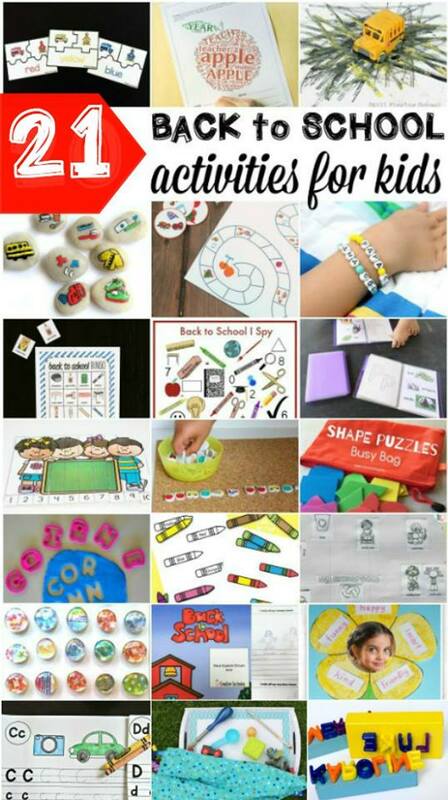 As a bonus there are some more great back to school ideas at the bottom of this post. My daughter thought this was one of the coolest ideas ever, so apparently big kids like this too. She started stamping with it and squealed “awesome, possom!” I was so glad too! We had all of these materials around. I have about three sets of unit blocks, and the smaller sizes are perfect for little fingers. 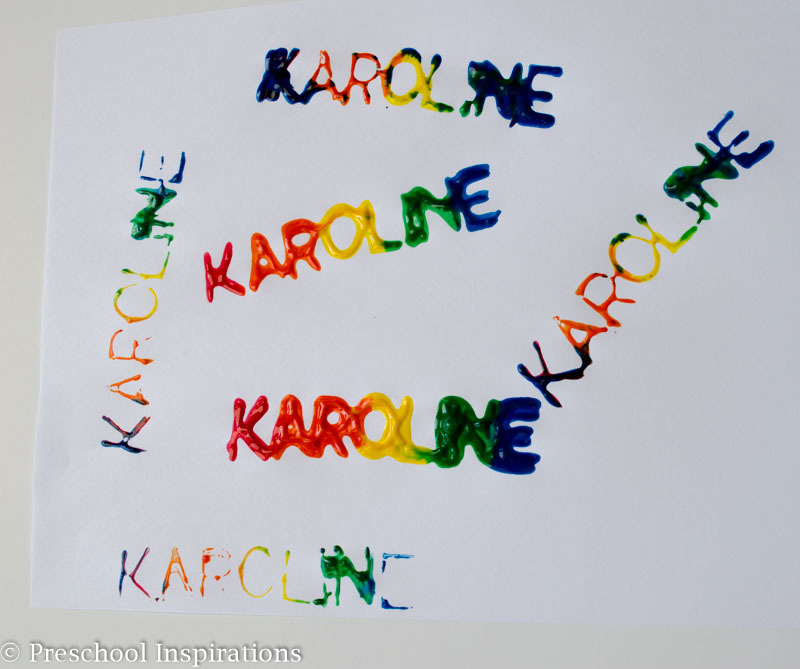 The kiddos found all of the letters to their names, and I used the hot glue gun to glue them on the unit blocks. Edit: The hot glue did not hold great, so we went back and used super glue instead! 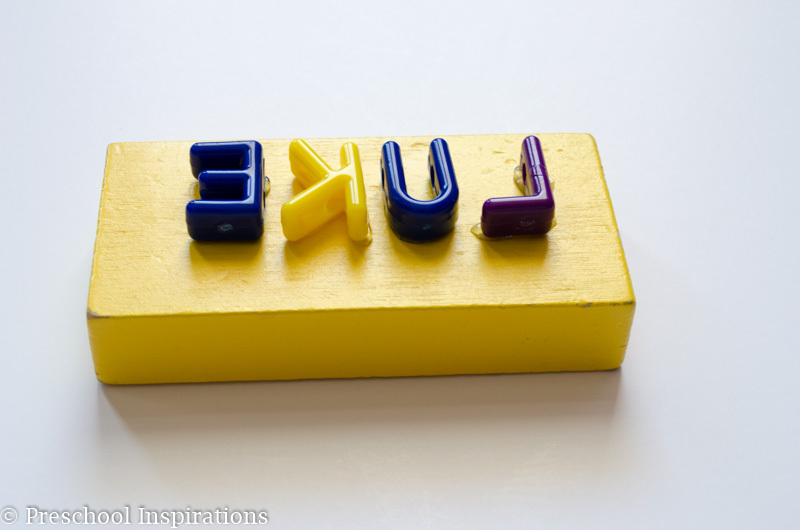 You have to put the letters backward and in reverse order. That’s the trickiest part! 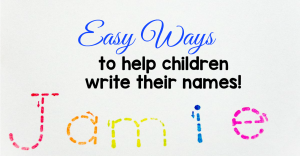 I am pretty sure I checked each child’s name at least five times! Once they are all secure, then it’s time to stamp! I didn’t have uppercase and lowercase letters at the time. Now I have both, so we’ll be making new ones this year with uppercase and lowercase letters. 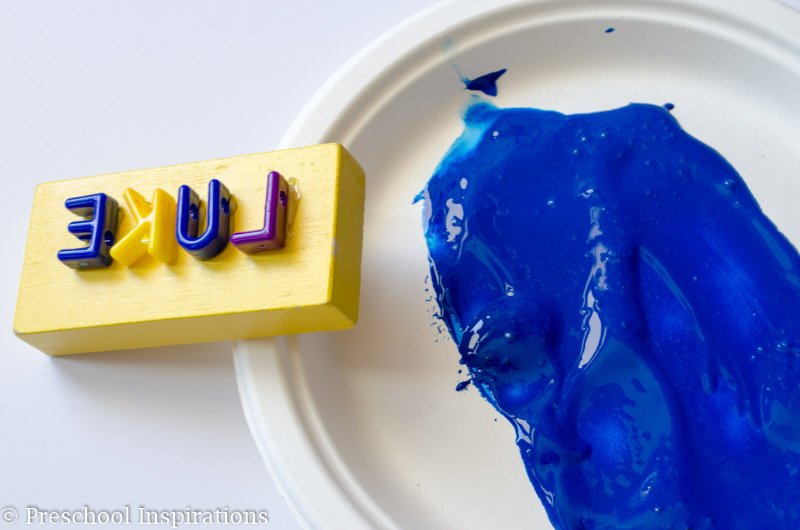 Take some tempera paint and spread it out as flat as possible. You can even use a squirt of water to help with this. Then let the stamping fun begin! My preschool aged son also thoroughly enjoyed this. He is all about name activities, writing, and of course the cool parts of being four years old — Ninja Turtles (although we have never even seen it, ha). 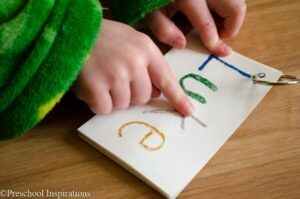 He quietly stamped which meant that he loved it since he was so absorbed in it. We have to remember this about the quiet ones sometimes. The last tip I have to offer is to spread the letters out if possible. Names with seven or more letters can be a puzzle to figure out how to get on, but completely worthwhile once you do. Then you can wash them off or if the paint dries on, it easily peels off afterward. Now keep scrolling to see 20 more awesome ideas below!! Where can I buy letter beads at? I checked Amazon.com but they are expensive. My two little ones have similar names so I don’t want to spend like $40 on two bags of letters. Great question, Kei! I got my letter beads from Discount School Supply, and I added the link in the post above. You would definitely only need one bag! There’s around 10 of each letter, so hopefully that helps you. I’ve also heard that craft stores sell them. I haven’t seen any myself, but I would recommend calling one so you don’t have to make a trip unless necessary. Bonus if it’s a craft store with awesome coupons!